EGO Power Plus Lawn Mower Reviews - Ideal Option for You? 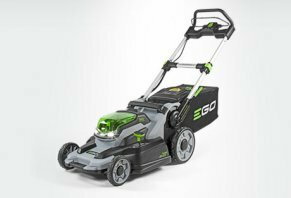 The EGO Power Plus Lawn Mower claims to be the most powerful rechargeable mower available, while offering the same performance as a traditional gas mower. If you’re looking for a more environmentally friendly way to mow your lawn and to avoid many of the hassles associated with traditional gas mowers, the EGO Power Plus Lawn Mower claims to be the most powerful rechargeable mower available. In fact, the EGO Power Plus Lawn Mower is claimed to provide both power and convenience in an eco-conscious, easily storable package. But do the benefits provided by the EGO Power Plus Lawn Mower outweigh the negatives, and is it a good use of your hard-earned money? Let’s trim the facts and see the results for ourselves. At the core of the EGO Power Plus Lawn Mower is a 56-volt lithium-ion battery, which is claimed to be 40% more powerful than the leading 40-volt battery. In fact, with the addition of the EGO quick charger, you can have your battery fully recharged in 30 minutes or less, which can also be used with the company’s other lawn maintenance tools, such as the straight string trimmer, blower, and hedge trimmer. Just insert the battery and go. EGO also claims that one handle adjusts the entire Power Plus Lawn Mower deck, and the two-touch safety lever allows it to easily start without pulling or priming. In addition, since the Power Plus’s motor is electric, there is no associated yearly maintenance or winterizing during the cold months. 20" deck, so you’ll be able to mow your lawn in fewer passes. 3-in-1 mulching, bagging, and side chute options. LED headlights that allow you to mow any time of the day or night. EGO Power+ motor that is 20% quieter than a gas powered motor. Compact foldable design and collapsible handle allow it to be stored just about anywhere—even vertically since you don’t have to worry about any gas or oil spilling out. The EGO Power Plus Lawn Mower is currently available only through Home Depot and is priced at $499 plus free shipping. As far as replacement parts, you’ll pay $130 for the 2.0Ah battery and $200 for the 4.0Ah. A standard replacement charger will set you back $70, while the 30-minute charger is priced at $100. However, keep in mind that the 30-minute charger can only be used with the 4.0Ah battery. All EGO batteries and chargers come with a three-year warranty. In order to inquire about the EGO Power Plus Lawnmower, replacement parts, or the product’s warranty, you’ll need to contact customer service at 855-346-5656. What Do Other Consumers Have to Say About the EGO Power Plus Lawn Mower? EGO is based out of Geneva, IL and is not listed with the Better Business Bureau. However, all of their lawn equipment, including the Power Plus Lawn Mower, is manufactured in China. The EGO Power Plus Lawn Mower seems to have a very positive online customer reputation, although some of the most common complaints cite high price that is not justified by its performance when compared to traditional lawn mowers, poor cutting performance even at higher deck levels, thereby requiring multiple passes of the same areas, short run time (~30 minutes), faulty batteries, and flawed chute design (see more about this in the following section). What’s the Bottom Line About the EGO Power Plus Lawn Mower? Now that you know a little more about the EGO Power Plus Lawn Mower, if you’re concerned about being environmentally conscious, is it worth your hard-earned money? Overall, it seems like the EGO Power Plus Lawn Mower provides fairly good performance, especially when compared to other electric mowers on the market. However, this doesn’t mean there aren’t some important factors to consider. First, one of the most common customer complaints we encountered during our research cited that the mower’s side discharge chute tends to strike the ground when turning, which causes it to fall off. While several customers recommended fixes that could alleviate this problem, they also noted that this may void the warranty. EGO has acknowledged the problem on their discussion boards, but as of this writing, no change to the design has been made. Second, the EGO Power Plus Lawn Mower is not self-propelled. While the company’s rationale for this is that the mower is light enough to be pushed without it, if your yard is relatively large and/or hilly, this could quickly present a problem. On top of this, Power Plus’s battery charge will only last about 30 minutes, which means you may need to frequently recharge before your entire lawn is mowed. Add to this the fact that numerous customers complained the EGO Power Plus Lawn Mower doesn’t always cut evenly, and as a result, you may have to pass over an area multiple times in order to obtain a nice even cut. Finally, although lithium-ion batteries can last anywhere between 300 and 4,500 charges, depending on how low you allow their charge to get during each cycle, replacement batteries for the EGO Power Plus Lawn Mower are fairly expensive. In fact, the 4.0Ah is about 20% the cost of a completely new mower. We have had our self-propelled EGO Mower for two years now. Our son bought one a year before. My wife tried it at his place a LOVED it, because of the light weight. We were using a regular push mower (not self-propelled) and I was thinking about buying a self-propelled mower. My wife enjoys using a push mower for the exercise (lucky me). We noticed this year, the EGO doesn't cut evenly! I do not know what is wrong with it! I have set it on my workbench and measured, but I can't find the problem! I have used our son's EGO at his place and noticed the same thing! It looks like a wave across the yard. My wife has started mowing in both directions to solve this problem. Back and forth. Nothing like mowing the grass twice in the same day! I am happy with everything else about this mower BUT who wants to cut the grass two times! We DO have the EGO leaf blower as well as the string trimmer and love BOTH of those! The batteries wear out too fast. I went through three batteries, got to use batteries a total of 10 to 15 times on all three. I am VERY disappointed and will not buy or recommend. After one season of satisfactory performance, the throttle on my self-propelled mower is stuck at 100%. I have a hilly yard and this issue results in an unevenly mowed lawn and a poor overall mowing experience. When I first called EGO, I was told to take it into Home Depot for service and warned by EGO rep that I may be told by Home Depot that it may be 4-6 weeks. He said that it usually would not take this long and I should call EGO back if Home Depot holds to that timeline. When I called back in to EGO, I was told that 4-6 weeks is an accurate estimation and expectation of service timeline. When I complained about experience and service lead time, I was told my case would be "escalated" to which I received a confirmation email. I subsequently received a call from HD saying that they were not equipped to fix the issue and my mower would need to be sent out of state where I would now have to wait nine weeks to get my mower back. I’ve had very few issues with my previous mowers and when I did, had reasonable repair lead times. What do I do for nine weeks? I didn’t pay $500 for a mower to pay someone else to cut my lawn. I feel that if EGO is going to sell a product nationally, there should be an adequate service network in place. Post update: When I picked up my (not repaired) lawn mower, the console was not properly screwed back in and as a result of not noticing, I lost at least one screw. I submitted this review on EGO’s community website which, after EGO review and required editing, was accepted, confirmed and subsequently removed. Also, although I have a case number and documentation, my account is showing no cases when I log in. I had a similar experience with EGO support. I'm trying to get a legitimately negative review on either the Home Depot website or EGO website. I got confirmations from both that the reviews were accepted, but neither was ever posted. It makes me believe that there are many more complaints than they would lead you to believe. I purchased my EGO LM2100 (not self-propelled) at Home Depot in the fall of 2017. I only had a few chances to use it before winter set in, but I found it worked perfectly with the bag for picking up leaves, though the bag is not large. I stored the battery properly over winter, and the mower is working perfectly here in the summer of 2018. I planned to use the side discharge, but found that plugs often and leaves clumps of grass on the lawn, my only minor complaint. The upside is that caused me to try the mulching feature, which works perfectly. Great power, quick recharge. No more gas mowers for me. If your EGO product breaks as my mower did, beware that Home Depot is your repair place. It will take 4-6 weeks to repair with no loaner program. Buyer beware! I live in Florida and need to cut the lawn twice a week now during the rainy season. Renting is not an option. This review is strictly about customer service. I own this self-propelled mower, a trimmer, edger, blower and the batteries and battery chargers that go along with them. I have owned them now for one year. Overall the equipment works pretty well. I have had issues with the 2.5 AH battery, they are warrantied for three years. In one year I have had two of them die. I do everything you are supposed to do to keep them running well. When I try to get in contact with EGO, I am unable to contact them. I have called and waited on the line for over 60 minutes, nobody ever answers. I have requested a call back, I have left messages, I have opened a claim online through their warranty website. Basically, they automatically close your claim, without contacting you in any way. I have never actually talked to a person who works there, because they never call you back or answer the phone. After two weeks, I finally just contacted Home Depot and opened a claim with them. They had to contact EGO directly before they would contact me to resolve a warrantied piece of equipment. The sad thing is, I have had to contact Home Depot both times, these were almost a year apart, so I don't think much has changed. Their products are expensive, but work pretty well. Just hope you never have to contact them about one of their products because they will be MIA or non existent. A good tip is to contact their partner (Home Depot), because they will resolve it once you get them involved. Unfortunately, I would not recommend this company to anyone. What good are your products, if your customer service is horrible? Stick with Ryobi. I purchased the EGO mower in April of 2017. After less than a year the self-propel feature stopped working along with the indication of the mower overheating in 68-degree weather. After being instructed by EGO support to take the mower to Home Depot for repair, I was informed by HD the mower would be shipped to Atlanta for repair, which takes anywhere from 6 to 8 weeks. If I would have thought about repair issues before purchasing the EGO, this would have been a probable show stopper. These mowers need to be designed so a DIY person can troubleshoot and possibly make repairs. Having to wait eight weeks is ridiculous. If this is going to be the case, EGO should have in place a deal with HD to lend a mower at no charge to the customer for warranty issues. Renting an HD mower would run from $600 to $800. I will admit that we were pretty happy with the mower operation (therefore the 2 stars) and up until yesterday (4/10/18) would have recommended it as a 5-star buy. But any tool that can take two months to warranty repair is not worth it. We've liked the mower but it is very fragile and we've had to fix it twice. Sometimes it just stops working while you're cutting grass. Generally, there is enough power in the unit, but don't kid yourself about high or wet grass. It just doesn't have the juice that an equally premium gas mower would have. There is a fatal flaw with the side discharge. It has not worked properly for me even one time. In early Spring I ordered another Toro, the same model number as my first mower. What came was the new version, and it was exhausting because the self-paced self-propel required you to push all the time. They kindly returned my money when I demo the old vs. new. I was still tired of using the older Toro because it struggled with the grass over knee-height by then. I bought an EGO Plus Lawn Mower 21 inch and SHOCK! It took off through thick, tall grass over knee deep by then, PULLED me up the steep hills on the property, mowed effortlessly, did not leave any piles of grass, and mulched everything! It would slow its pace when grass was really dense but this was a very slight change and then go back to normal. The slowest speed was perfect for a 70-year-old woman, but because it pulls me delightedly uphill, I can set the speed up and not get tired and get done in 1/10 the time I use to spend. The break to recharge is wonderful, just enough time to fix a big lemonade leisurely drink it. The rest break has perfect timing to refresh and feel ready to mow again! This mower proved more powerful than both of my 2-year-old ones and this year's newer model Toro both struggled to handle this deep of grass. LOVE it! I called three times. I complained to Home Depot to no resolution. Maybe I'll take it back. The mower worked well the first time. The blade cut well, and I ran it for the full 45 minutes of battery life. No complaints, but I worry about any warranty issues. How were you able to get ahold of anyone in customer service? I have tried for three days as well, and at one point, I was on hold for 56 minutes. I still didn’t get ahold of anyone. I've been using this mower throughout summer. It's only worth buying if you don't intend to use the catcher bag or are willing to constantly clear the clogged clipping chute. The motor is a little underpowered, but tolerable. Otherwise, it's a nice quiet mower which has headlights for continuing after sunset. The EGO mower is only worth purchasing if you intend to also buy the EGO line trimmer and EGO blower, which are fantastic, and you benefit from the extra interchangeable batteries. I still keep my old Briggs & Stratton mower as a backup for jungle mowing. Write a Review for EGO Power Plus Lawn Mower!